DO YOU NEED TO TRAIN HEAVY TO GROW? We have always been told that we need to lift heavy to grow and since in the fitness world most things become reality once they have been repeated often enough, this went unquestioned for a long time. Now, while it is true that an increase in strength is desirable, the question remains how does this apply to your training? The HT protocol was a split routine where each muscle was worked once per week, with three exercises per session, performing three sets of 10 reps, and resting for 90 seconds. The ST protocol was a total body routine where each muscle was worked three times per week, with one exercise per session, performing seven sets of three reps. The volume load (sets x reps x load) was equated so each group essentially lifted about the same amount of total weight per week. Training was carried out over eight weeks. All sets were performed to the point of momentary concentric muscular failure. After ten weeks, strength and mass was increased in both groups, with the ST group having gained more strength. Case closed? 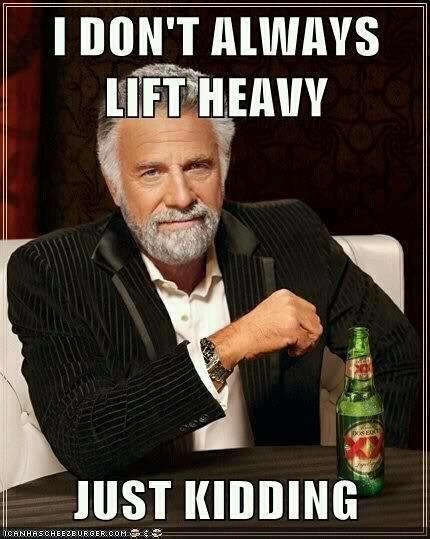 Heavy weights all the time? Not so fast. The ST group trained on average 70 minutes and was mentally-fried by the end of the study, as well as dealing with sore joints, whereas the HT group only trained 17 minutes and felt it could have done more work . So, it stands to reason that with a few added sets the HT group would have had greater hypertrophy without encountering the negatives that the ST group had to deal with. Muscles recover very fast (think 48 hours), but once the central nervous system is overloaded it can take weeks to recover. Heavy lifting create a fight or flight scenario where extreme stresses can be imposed on your nervous system and recovery ability. Previous post: How To Handle Social Media Without Going Insane! Next post: Are the Big 3 Exercises Needed to Grow?